Since the age of 11, I’ve watched WWE wrestling pretty much without interruption. There was a brief six month hiatus in the mid-90s when, at the age of 14, I felt I’d outgrown the sport only to quickly backtrack, realising that a life with no wrestling was no party at all. Then there was a brief spell in 2004, when dire circumstances, namely the one-two punch of a broken Sky Box and a hectic teacher training course, resulted in me not really watching the product for a few months. From Backlash 2004 to Vengeance of the same year, I just didn’t get to see much wrestling. So imagine my surprise, when my course complete and my student digs behind me, I returned home to a working satellite system to stuck on an episode of Smackdown, only to see that the blue brand had a new champion. JBL. JBL. J. B. Sodding. L. Previously, I had witnessed Bradshaw perform many roles in the company: Justin Hawk had been a jobber to the stars before Bradshaw became a second rate Blackjack and thoroughly poor role model for Taka Michinoku. Then the Acolytes segued from devil worship to the protection biz, pausing only to give Bradshaw a horrific singles run in which he achieved the sub total of Jack and Squat. By the time I went radio silent on wrestling in the Spring of ’04, it seemed as though his career was winding down and to be frank, few would have really missed him. But then he was drafted away from Ron Simmons, adorned with a new gimmick and given an unlikely and astonishingly sudden push to the very top. JBL became a main-eventer, a champion and most likely a future hall of famer. And no-one saw it coming. Like a good RKO, a push from out of no-where can be pretty effective. Audiences who had been conditioned to see Bradshaw as lower-mid card fodder wouldn’t have readily invested in a slow burn story that painstakingly outlined his ascent to the top; chances are it would have reached the point where they saw the end game coming and they would have become outspoken. WWE’s play, to radically rebrand the act and thrust him into the limelight relied on a combination of novelty and shock factor to overcome audience doubts about his suitability for the role. Basically, there was no time to debate it or mentally prepare for it: it just happened. And to an extent, it worked. JBL wasn’t a great champion but he’d be few people’s pick for worst champ ever either. He was kind of over and, in the early months at least, injected a sense of freshness to the title scene. He was new and it always felt like he could drop the belt at any moment, giving matches a sense of unpredictability and importance. When his title run came to an end, after a not inconsiderable 10 months, he remained an upper-mid card guy: not a superstar but an act of some relevance. The push of ’04 had garnered enough credibility for the character to maintain his spot until his (final) retirement in 2009. The JBL blueprint seems to have been dusted off and deemed ready for implementation in the strange case of Jinder Mahal. At Wrestlemania 20, JBL was part of a pointless four corner tag match; Jinder was getting slammed by Gronk on the pre-show at Mania 33. However, both headlined the next Smackdown brand PPVs, fighting for the title. How did they make such a quick jump? Namely because both were presented as characters that played on classic wrestling motifs: namely class and nationality. Analysts of films and television shows refer to a form of characterisation that involves stereotyping as shorthand for identification: why spend ages establishing character through needless exposition when a recognisable stereotype can get the audience in position for the next narrative development much more quickly? Lazy writing or effective characterisation? You decide but by playing rich, anti-American heel #1232, Jinder was able to jump straight into a programme that audiences could buy into. Indeed, Jinder’s upward trajectory has been even more stunning than JBL’s. Mahal was fired in 2014 and then brought back simply to be a body on the roster. Losing was his job description. As bad as some of Bradshaw’s early gimmicks were at least he wasn’t playing air guitar and selling to little people in his pre-title run. The reason for his push is a matter of debate. Whether it’s all a part of the India expansion or Vince’s undying respect for a man with good abs, Mahal’s rise has been extraordinary. Will he be a short term prospect, dropping the belt before returning to obscurity, or will he garner enough momentum from this run to keep him afloat for years, maintaining a television presence when others fall away? It is too early to tell for sure: when the camera cut to the Chicago crowd on Sunday some punters looked legitimately shocked and somewhat moved; others were simply laughing. JBL worked because the audience wanted to see him lose the belt: will Jinder be the heel people want to see get beat or will people simply stop watching? So as of now the push is working: kind of. Jinder’s name is a hot topic in wrestling and his first few defences will certainly have a novelty value. Whatever the motive behind it, WWE is committed to their new star and I for one hope that Jinder grows into the role: like the Maharaja says, diversity in wrestling would be a good thing. 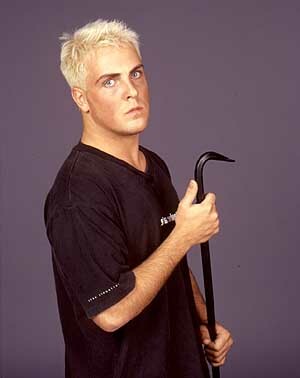 In 1999, WCW tried to get David Flair over as an in-ring talent. He won the US and tag titles and pinned wrestlers of note along the way, shooting a big angle where he turned on his father (hey, this is wrestling after all). The name Flair explains the thinking behind the initial push but the lad was so bad in the ring that it was mind-boggling that they persisted for as long as they did. This one was doomed from day one and with a mid-card as loaded as WCWs was, this was an exercise in nepotism, not clever booking. Eugene was a WWE character that supposedly had special needs: his promos were reflective of this fact and he was placed under the “care” of William Regal by his story line uncle, Eric Bischoff. This character was somewhat controversial (some of Regal's early references to his new charge were of poor taste and wouldn't be countenanced in 2017) but Nick Dinsmore’s portrayal of Eugene imbued him with warmth and decency to the extent that fans were quickly won over. Eugene, who was surely designed to be a low level comedy act initially, was quickly pushed up the card and wrestled Triple H at SummerSlam, before shaving Bischoff’s head in October. For a few months, this act was over but a lack of depth and character development led to Eugene losing his shine. WWE lucked upon something unique here but the gains were only short-term. Fandango was a big deal for a month in 2013. That, in the modern era, a ballroom dancer character got over at all, is pretty surprising but he did: the entrance song and accompanying dance threatened to break out and transcend the industry. After gaining a Wrestlemania win over Chris Jericho, he was slated for an IC title run, However, the curse of 50: 50 booking and an injury seemed to derail everything. Here circumstance and company foibles conspired to interrupt even a quick fire push.